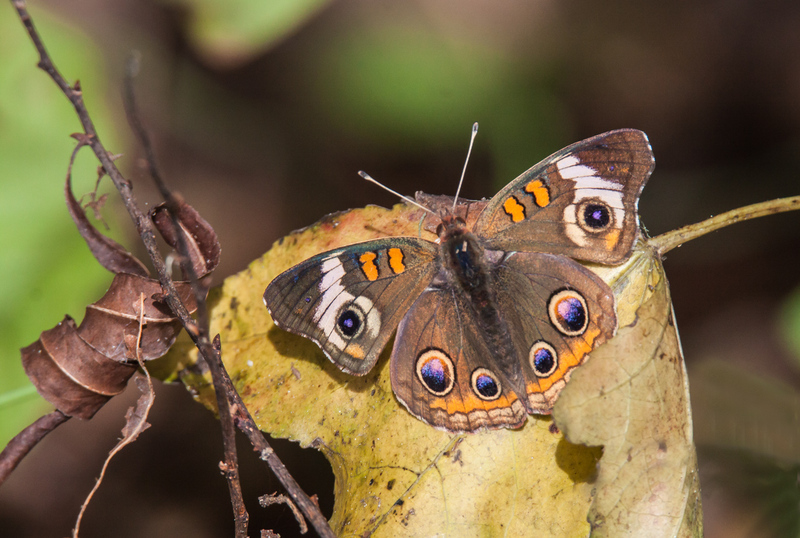 If it hadn’t been moving, I am pretty sure that I would not have spotted this Common Buckeye butterfly (Junonia coenia) on Friday at Huntley Meadows Park. 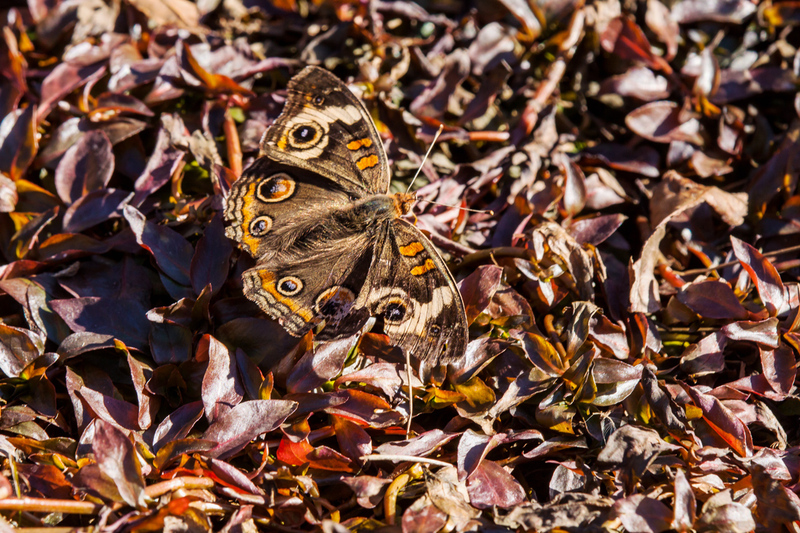 The butterfly was perfectly camouflaged among all of the fallen leaves and even in this cropped image you have to look hard to see it. 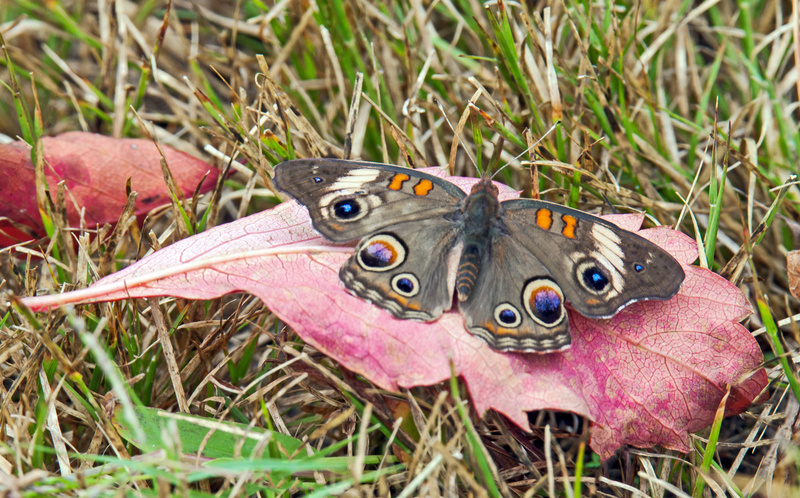 I am also including a copy of the original image, in which the butterfly is even harder to find. The image reminds me of some of the complicated jigsaw puzzles that my Mom used to like to do when I was a child. I remember one puzzle that was a circular one depicting a plate of spaghetti. Needless to say, my Mom had a lot of patience and persistence. This Common Buckeye butterfly (Junonia coenia) was so focused on the goldenrod flowers that it was either unaware of my presence or simply didn’t care on Monday at Jackson Miles Abbott Wetlands Refuge. I was therefore able to capture the beauty of the butterfly from a somewhat unusual angle that lets us see some of the wonderful markings on the body as well as on the wings. 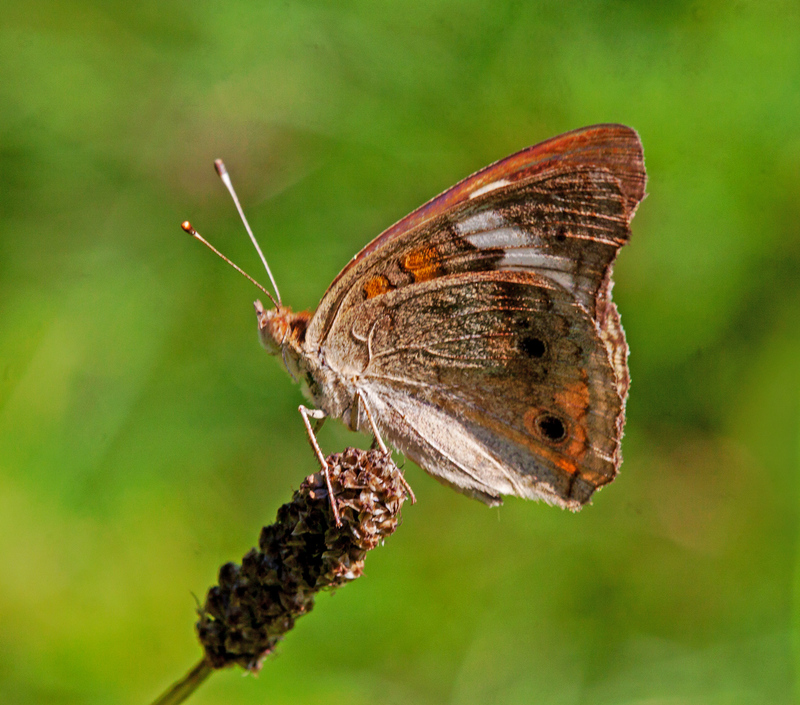 I first spotted this small Common Buckeye Butterfly (Junonia coenia) as it was flying low above a grassy patch at Jackson Miles Abbott Wetlands Refuge. Periodically it would stop and I would attempt to get a shot of it. It was probably hilarious to watch our little pas de deux—the butterfly would fly and perch and I would bend my knees and crouch, which served as a signal for the butterfly to take off again. I’m pretty patient, so we danced this way for quite a while before the butterfly decided to perch on some low vegetation rather than on the bare ground. 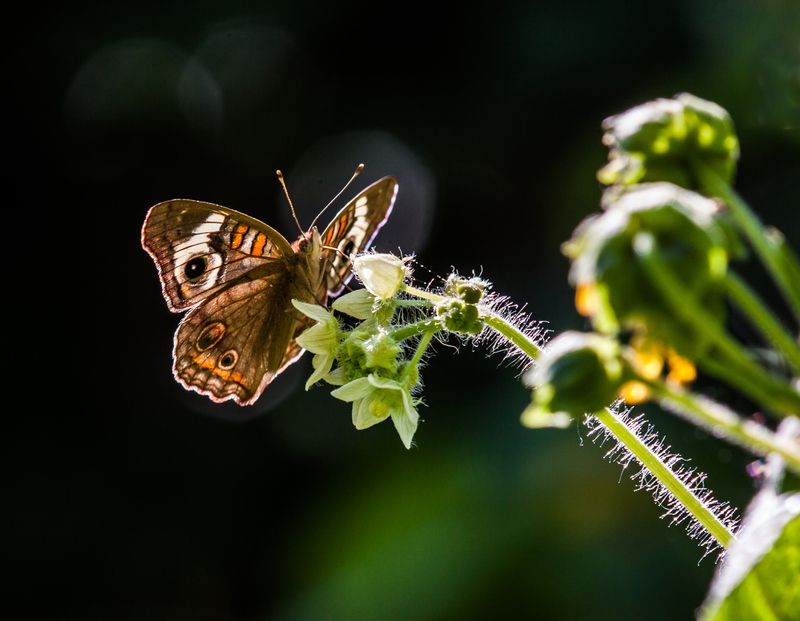 I was finally able to capture a shot, though the butterfly didn’t pose long before taking off again. As I continued the chase, my knees started getting a bit sore. 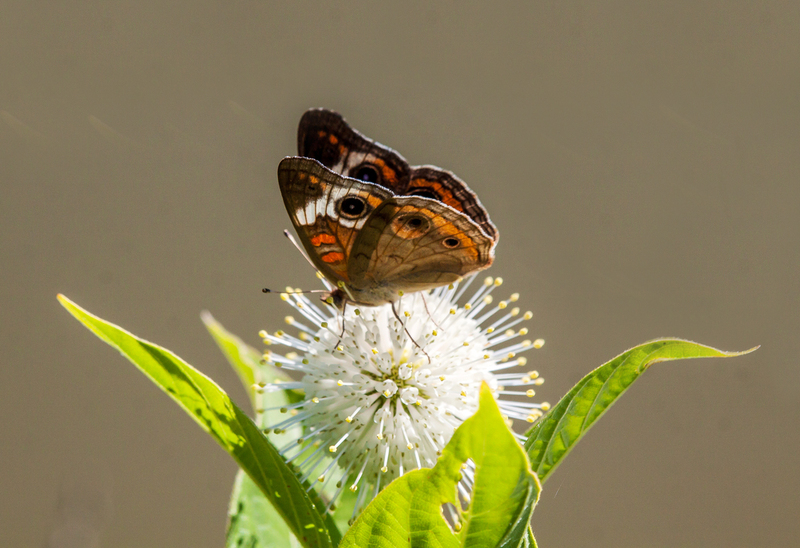 I was thinking of giving up the chase when suddenly the butterfly flew higher into the air and landed on a buttonbush (Cephalanthus occidentalis). These bushes are a virtual magnet for butterflies and I love the spiky spheres of the plant. I wasn’t able to get very close to the buttonbush, but captured this image that I really like. The chase ended here and we went our separate ways. I hope that I never get too old or too self-conscious to chase butterflies, a pursuit that makes me feel like a carefree child again. 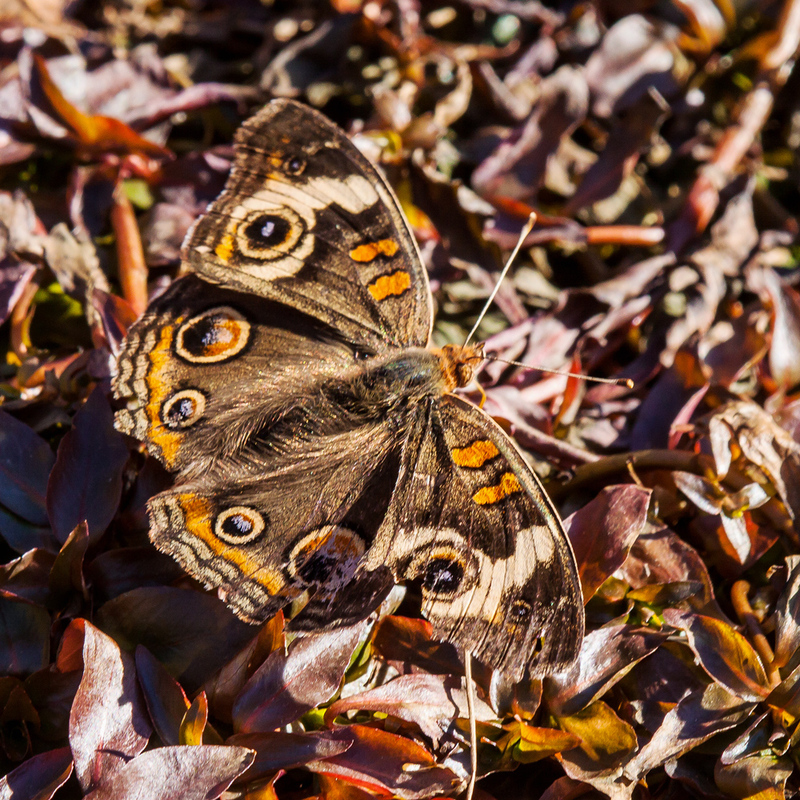 At first I thought it was only a leaf blowing in the breeze and then I slowly came to realize that it was a Common Buckeye butterfly (Junonia coenia), an unexpected sight in mid-November. 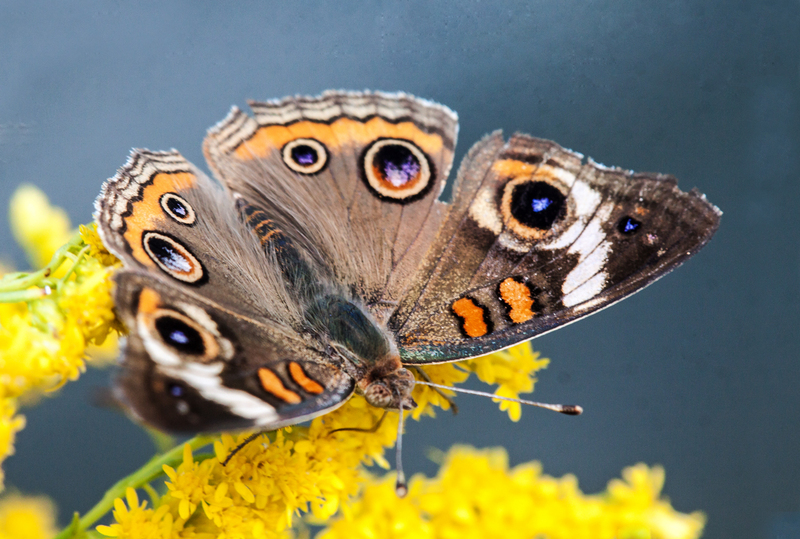 Although faded and tattered, this survivor butterfly is still spectacular, despite its “common” name.